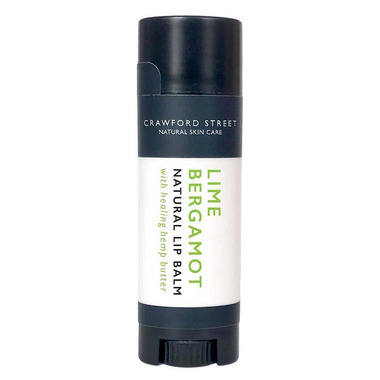 Crawford Street Lime-Bergamot Natural Lip Balm will help to prevent and heal cracked and dry lips, it will also help to prevent cold sores. Love all of her lip balms. They smell lovely and they are effective. They have passed the test during really cold weather too! I love the feel of this lip balm, and the scent is very subtle. Its shape is unique. Wonderful product. I'll be ordering again. I love Crawford Street products. This is my third Lime-Bergamot Lip Balm. These last a long time and are wonderfully moisturizing. Goes on smooth and feels ultra-hydrating. The Lime-Bergamot smells divine as well! I also really do prefer the shape of this tube compared to the usual round ones as it seems to apply better. I found this to be very hydrating and stays on nicely. I'm allergic to shea butter and it's very difficult to find a lip balm without it. This is my favourite that I've tried. Also I like that it isn't peppermint which makes my lips feel dry afterwards. Very hydrating lip balm and I also agree it is not waxy. The lime is very strong, so be sure you love lime flavour :) Also, the tube is not round it is oval so I found that a bit different at first. Waxy and not hydrating enough for me. Now one of my *favorite* lip balms. AND I am a lip balm fanatic. ;) Very hydrating, not waxy at all. Low-key, lovely 'taste,' not overwhelming or lingeruing. Reminds me of John Masters' Lip Calm (regular), but less citrusy /'biting,' longer-lasting, and half the price. Can't beat that.